I don't know about you, but I had quite the busy winter break, with lots of ups and downs and life-turn-arounds. But we're back to the usual wonderful routine now, full of massage and laughter and food and family -- and soon, facilitating a great wellness class! 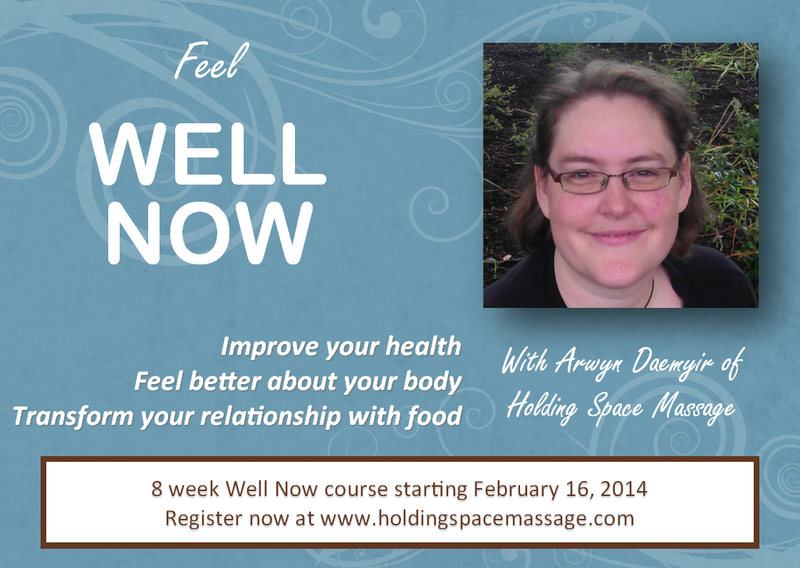 The Well Now course has been helping people improve their health, confidence, and compassion in the UK for years. Now, thanks to Lucy Aphramor and the USA's own Linda Bacon, I've been lucky enough to receive the training and licensing to offer it here in Portland, Oregon. Do you want to transform your relationship with food? Well Now is an 8 session course that helps people feel better about their eating and weight using a non-diet approach called Health At Every Size (HAES). You can read more on HAES practice here [pdf]. 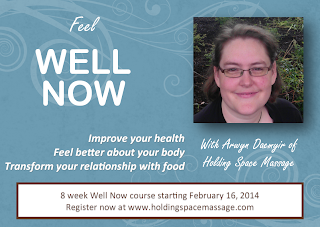 This 8 week course will be offered Sundays 2-4pm starting February 16th, 2014. The cost of the course is $360, but if you register by January 22, 2014, you can take this life-changing class for just $295. Class limited to 10 people, so sign up now! Eating effortlessly and healthfully, without struggle or guilt. Enjoying movement, rather than using it as punishment for "indulgence". Feeling confidence and pleasure in your body right now, exactly as it is. Improving your relationships, as compassion and justice replace criticism and judgment. Taking real steps to improve your health in measurable ways, like lower blood pressure and blood sugars, without restrictive food rules. It may sound like a dream, but it can be reality. Join me to explore how to make it yours! Contact Arwyn with any question or to sign up. Or, for your convenience you can register online now.